While on You Tube recently, I found a series of compilations from the "Railway Roundabout" TV series produced between 1958 and 1962 in England by the BBC. These are extracts from what had been half hour long programs that covered rail developments from a railway enthusiast point of view. One of the two photographers involved was Patrick Whitehouse, a well known author of railway books, who I had met in China in 1980, some twenty years after these programs had been made. The compilations are about fifty minutes long, mainly in black and white (TV in the UK was only B&W in the 1960s) but some sections were filmed in colour perhaps with a thought to the future. "Ostensibly for children" ... but we know better! Thank heaven all the original films have been carefully preserved. So many contemporary American programs for television have been lost, or survive only in fortuitously kinescoped versions. They are definitely compelling! Thank you for posting the links, Peter. Glad to see some Un-rebuilt West Country class running with the original front end with some clean passenger cars behind them in BR era, they were slippery but served until 1967. Note that "Clearance measure device" in the second video and the "man-powered" turntable in the first video. 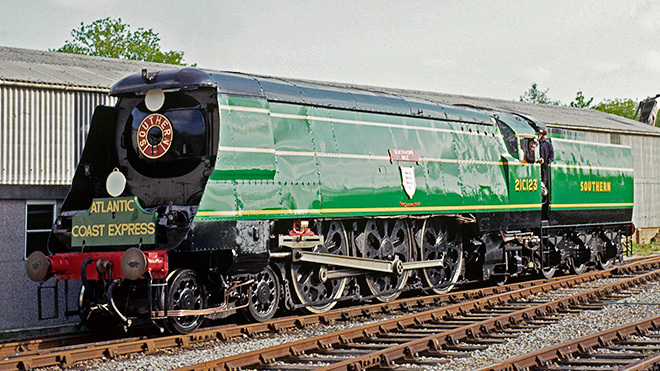 Surprise to see ex-GWR 3700 Class in color, which is one of my favorites early steam locomotive. Noted how the British folks loved their steam engine in the video. So many steam engines were well preserved in the UK, just like their Trolleybus, Tram and Bus etc. To an American - all the English engines with their internal piston movements look strange - just side rods exposed and no piston rod visible. OK, and please tell me again, why English engines NOT have headlights? Getting on the mid-way of 60 and forgot. OK, and please tell me again, why English engines NOT have headlights? Right-of-way (containing permanent way) is entirely enclosed in Britain, so no need to watch the track for obstructions. An amusing consequence of this was reported for train service in the south when those 'pea-soup' fogs and smogs were common. Most things would be barely moving with about 15' visibility ... except the expresses which would be thundering nearly nose-to-tail at 60mph or so. ... then I found out what was really going on, and wasn't very happy. While not signals, the Great Western at least had an "Automatic Warning System" that sounded a bell and operated a visual indicator if a signal at caution or stop was passed. It may have activated the brakes in the latter situation. It was intended for use in fog or restricted visibility due to storms. It was fitted to many GWR passenger locomotives from the 1930s and was developed by BR into a system that is still in use today. 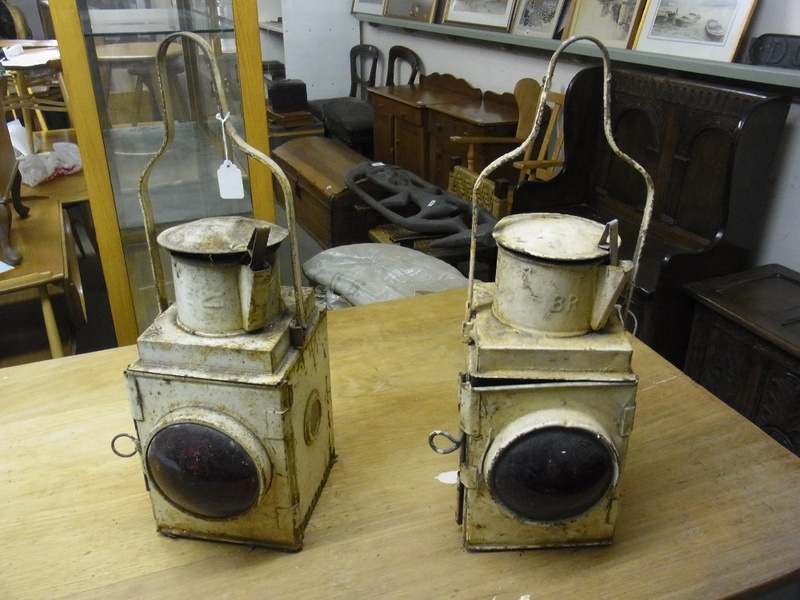 I thought those small lanterns on UK's steam locomotive were only as bright as a small torch when I was a child; I imagined my torch is the headlight of a train and play with them at night, thus my father bought me lots of different type of torches. Back in those days, people couldn't easily find the answers they looking for even in the largest public library in a big city. In many of my drawings, I always pay a lot of attention on the oil lamp box of early US-style 4-4-0 or 4-6-0 steam engines. I felt quite disappointed to the fact that those small lanterns only served as the marker lights to identify the type of train and were not that bright. But on the other hand, I admire the UK railway signaling system and other safety measures which some of them are still in use. I would have loved UK steam engines better if they had the super bright headlight.